This story begins in Anchorage, AK on June 19. My Alaska Air flights from Denver were flawless, and I found a taxi that took me to the Lake Hood Inn on Sunday afternoon. 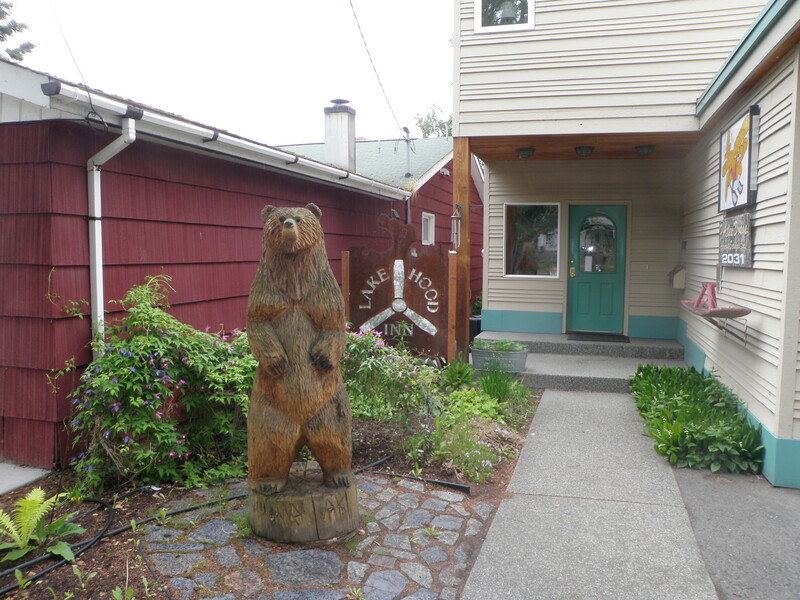 I met my fishing companions for the week at the Lake Hood Inn. They were Michi and Don Henley and Dr. Steve McKenzie from Hemet, CA. Don and Steve were fishing buddies that spent a lot of time on a southern California lake fishing for bass and striped bass. We commissioned a taxi that took us to downtown Anchorage to the Glacier Brewhouse for dinner. Anchorage is a small city that seems even smaller than a city because of all the open spaces with evergreen trees and lakes. It was partly cloudy and cool on Sunday with highs probably in the low 60’s. On Sunday morning I awoke early and prepared to be picked up by 7AM. The innkeeper arranged for a friend to shuttle the four of us to the Illiamna Air Taxi terminal near Ted Stevens Airport. I arrived at the airport and checked all my bags and waited for the others to arrive. 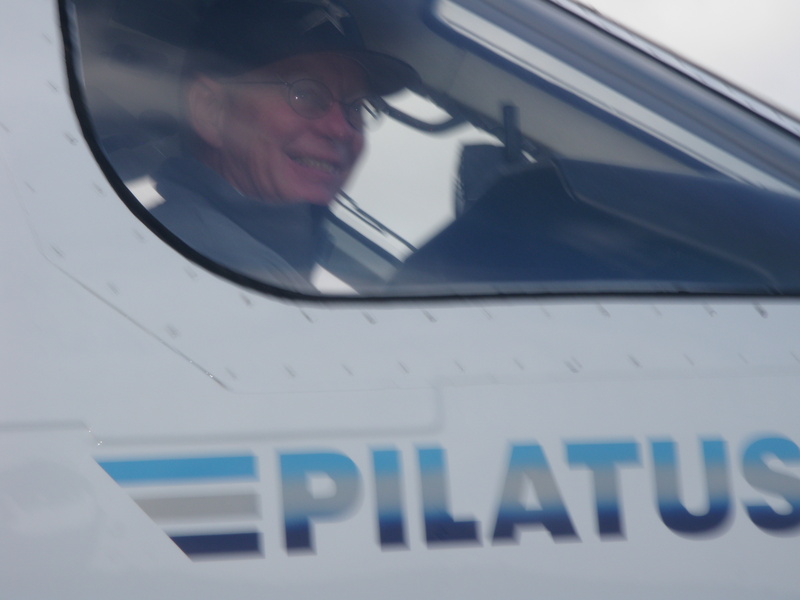 It didn’t take long, and the four of us met pilot Nick and boarded the Pilatus airplane. I was selected to sit in the co-pilot seat up front. Nick ran through his checklist and discovered a flap light that remained lit on the instrument panel. He found the procedure for rebooting, and I actually had a role holding a switch in during this process. After running through the checklist a second time, another light remained on that was not to Nick’s liking, so we all exited the aircraft and returned to the terminal for a short period of time until Nick could locate the owner of the air taxi service. At 9:40AM all systems were go, and we took off under cloudy skies. The departure was 1:40 later than scheduled. I watched the GPS navigation system, altitude instrument and fuel gage during the entire one hour flight. When we reached Illiamna and dropped out of the dense cloud cover, we were almost on the ground! Once in the Illiamna terminal I discovered that we were grounded indefinitely due to low cloud cover. The Beaver floatplane that was scheduled to take us across the lake could not be flown by instruments, so visibility was imperative. The Socal group and I hung out in the airport watching it rain and reading, but it was difficult to remain patient being this close to my long anticipated week of fishing. There was another group of six fishermen from the California bay area also waiting in the terminal for a flight to Copper River Lodge. The group somehow commissioned a van and picked up some snacks at the only store in Illiamna. They shared with us, and I was so hungry I ate a cold uncooked hot dog for the first time since I was a kid. Finally late in the afternoon, Mark Higgins, the owner of Rainbow Point Lodge, called to inform the terminal that he was going to bring his boat across the lake and pick us up. We all jumped into our fishing waders to stay dry, and piled into a pickup truck driven by one of the Illiamna Air Taxi workers who drove us to the dock on Lake Illiamna. We all climbed into the cabin cruiser and enjoyed a 40 minute ride across the lake to the Rainbow Point Lodge. 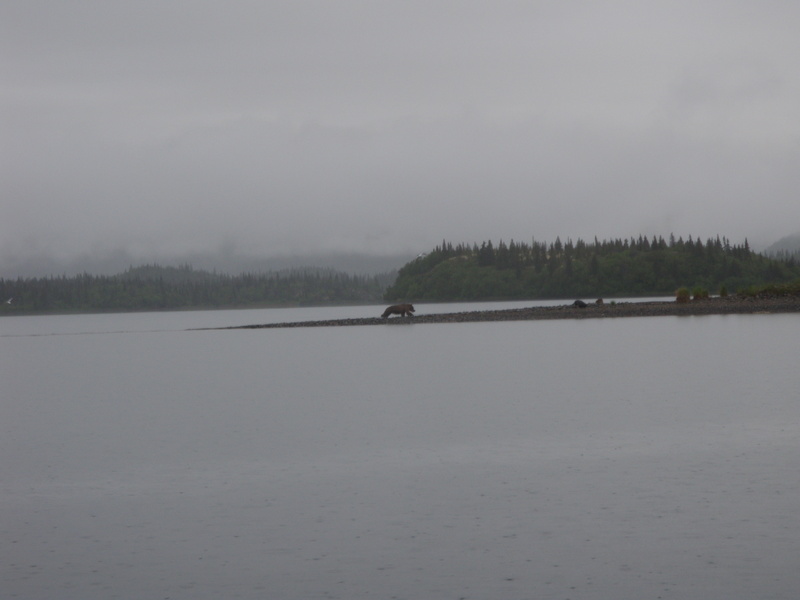 It was still raining steadily, but since there is daylight virtually 24 hours a day on June 20, Mark said we could go out fishing as long as we wanted. The guides were ready to work. We elected to have a satisfying dinner prepared by Slam, the cook, and then jumped back into our fishing clothes. I was assigned Jordan Carter as my guide, Michi and Don had Mike, and Dr. Steve would work with Jared. Jordan led me to his jet boat and we were off to the Copper River. The ride from the lodge to the mouth of the Copper River was roughly 15-20 minutes. I had my face tilted down and used my left hand to pull my rain hood down over my face as the rain was pelting quite strong due to the speed of the jet boat. Jordan gave me a shout to look up and watch a bear that was swimming across the lake in front of us. By the time I got out my camera and snapped a picture, the scraggy creature was on a protruding gravel bar. Dr. Steve was already out and fishing, so we cruised by him and ran the boat on the shore of an island and began fishing. Jordan started me out casting a purple articulated leech streamer and I hooked but failed to land my first fish. It didn’t take long, however, before I hooked and landed a nice 13” rainbow on a white marabou flesh fly. We moved the boat to a new position further upstream, and while fishing near Dr. Steve and Jared, I hooked a nice 20+ inch rainbow on the purple leech. 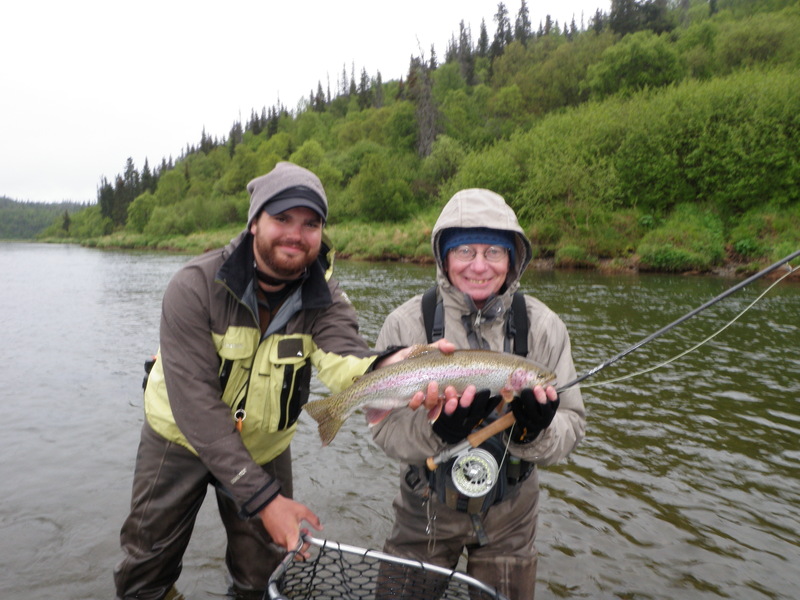 Jared took my camera and snapped some nice photos of Jordan and me holding the beautiful wild Copper River rainbow. It was quite damp and chilly so we quit fishing at around 10:30PM and headed back to the lodge satisfied in knowing that we’d reached our destination and had a bit of success. I had four hookups and landed two fish, one in excess of 20 inches. Also during this first Alaska experience, Jordan let me use his two-handed spey rod, so I received a bit of instruction on a new type of fishing.